The forts of Rostaq and al-Hazm is part of the Tentative list of Oman in order to qualify for inclusion in the World Heritage List. You’ll easily end up with ‘fortress fatigue’ when travelling through Oman: in the past, local chiefs built them in high numbers to protect strategic positions and water sources. On my second day in the country I was still up for visiting some good forts though. Along what is called “the Rostaq loop” lie 3 worthwhile examples, of which those of Rostaq and Al-Hazmhave a combined spot at Oman’s Tentative List. The third fortress, that of Nakhal, has the prettiest setting of them all. However, the very brief tentative site description gives no clue why it could not join the other two to be part of a future WH nomination. 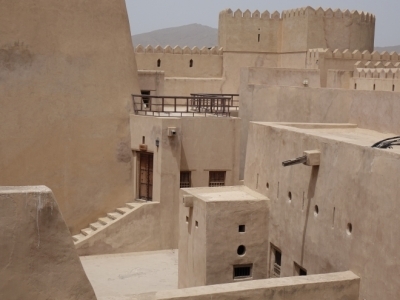 Rostaq is a former capital of Oman, and it holds one of the oldest remaining forts in the country. It was built on top of pre-islamic fortifications. It’s huge: while looking for a parking spot I drove for hundreds of meters all the way along its outer walls. Fortunately one can park right at the entrance. The fort is not only large in surface, but also in height: it has 3 levels. These are connected by stairways that are not easy to find. There are great views from the roof and the towers over the surrounding countryside with its date palms. Cultivating dates was (and is) an important craft in Oman, and inside the fort there are date storage and date ‘honey’ production rooms as well. 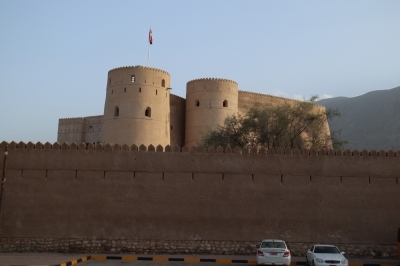 Large forts like this one in Rostaq were more like castles, where a ruling family lived and entertained guests. It also had its own mosque within the walls. The most splendid rooms are said to be those of the imam, but I found them closed except for one with indeed a very nicely decorated wooden ceiling. The 18th century fort of Al-Hazm lies some 20 km east of Rostaq. This is a much more compact building. After paying the same entry fee as I had at every fort this day (0.5 rial/1 EUR), I this time received an audioguide with my ticket. I must say that this was a bonus as the other forts that I visited earlier in the day came with little explanation. The audio tour also followed a numbered route, so you will not get lost here or miss an important part. Al-Hazm has the best examples of decorated wooden doors among these forts. The masterpiece is the main entrance door made out of Indian wood from Surat. A number of the rooms are redecorated with furnishings and displays – they seem to have used the same textbook for this at all the 3 forts along the loop, resulting even in similarly coloured pillows in the meeting rooms. Here at Al-Hazm you will also see how they used to cool water by hanging pottery jars in front of the windows to catch some fresh air. The Rostaq loop along 3 forts and with opportunities for some more historical detours is an often recommended day trip from Muscat. It starts and ends about an hour north of the capital at the main highway #1 to the United Arab Emirates, and follows secondary roads 13 and 11 in a 150km long circular route. Although I found the 3 fortresses worth visiting, I had expected the drive as a whole to be more scenic. Currently there are major roadworks going on especially at the first half of the stretch. There was also quite a lot of traffic. These forts lie in the foothills of the mountains, unfortunately it was too hazy on the day that I visited to see much of the scenery along the way. In case of this TWHS, the road taken was even more interesting than the actual site. We saw the burial tumuli of Al-Ayn and then decided to drive the shortest way possible to Al-Rustaq. Long story short, don't. The road seems to be okay for a while and then it gets worse before getting abysmal. 4WD would have been better, as the road gets bumpy and dusty, but at least you can catch glimpses of some unique local places. Anyway after a bumpy ride we arrived and parked our car by the fort. It was Friday, so it was closed in the afternoon, therefore we opted for the next best thing and walked around it. It's huge. If you've seen some other places of the Omani irrigation system WHS, this one has some too: there's a visible aflaj around, oasis and some wells. Rostaq fort is located at the foot of the impressive Western Hajar Mountains, a range of bare steep sided mountains. The fort itself does not seem as dramatically located though as the one nearby at Nakhal. Rostaq is distinguished by having a falaj flowing beneath it, but this feature is already included on the WHS list. Rostaq is located on a loop road off the Batinah highway, and makes a delightful side trip when travelling between Muscat and Abu Dhabi.